Hanging out in Canada isn't all that much different from hanging out in the United States. They've got pretty much all the same things that we've got, just with a heavier European influence. That being said, there are some truly unique things to eat in Canada. I've already had en Elk burger, some candy called Aero (chocolate with a bubbly interior that's sometimes filled with flavoring of various different types) and ketchup flavored potato chips. The most unusual thing I've eating, though, is something called poutine. Poutine is basically french fries and cheese curds topped with brown gravy. It originated in Quebec, which suggests a French influence, although it may have spun out of a British dish of chips and cheese and gravy. 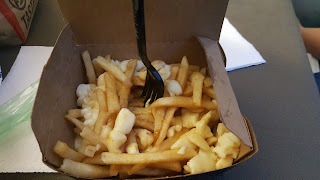 I had heard that poutine was generally sold in diners and greasy spoon type restaurants, but, as it turns out, you can get them in just about any fast food place in Canada like McDonald's and Burger King. For my first poutine experience, though, I opted to sample some poutine from an actual poutinerie. 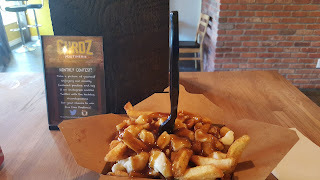 So, after a brief walk along the Ontario river in Burlington, I headed up John Street to Curdz Poutinerie, which is part of a small but growing chain of poutineries. Upon hearing that I was an American out to try his first poutine, I was excitedly presented with their classic poutine. There are many different varieties available at a poutinerie, but I opted for the classic so that I could get a bead on this dish. It's not bad. It's tasty enough, and I love how the gravy melts the cheese curdz and absolutely drowns the fries into a soggy, gravy filled, cheesey mess. That being said, I think poutine is a bit too heavy to eat as a side dish with a burger or a steak. It seems to me that it'd be perfect for a night of drinking, or as a hangover breakfast. McPoutine. There really is gravy there. I swear.